What Is An Abnormal Frenum? Is Frenectomy Necessary? A frenum, or frenulum, is a small fold that keeps two tissues from separating or moving too far away from each other. They exist in several areas throughout the body, but the most commonly known frenums are beneath the tongue and under the upper lip. 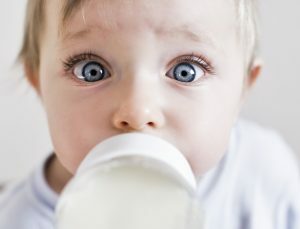 Babies are often born with frenums that are too tight, which then restrict the motion of the tongue and lip, inhibiting proper feeding and the development of the teeth and oral structures. An abnormal frenum causes a condition we call lip or tongue tie. It is corrected with a frenectomy, which Dr. Preetha Thomas specializes in at Enclave Dental. In the beginning, perhaps the most noticeable effect of a restrictive frenum is in the issues it causes during feeding. Babies who have lip or tongue tie may also have a lot of trouble latching onto the breast, and may experience gassiness or irritability as a result. These difficult (and often painful) feeding sessions leave parents feeling frustrated and at a loss for what to do. If the abnormal frenum is not corrected during babyhood, it may lead to other problems as the child grows up — especially with speech, nutrition, and the proper development of the teeth. Kids who have lip tie may experience gapped front teeth as a result of the restrictive frenum. Tongue tie can also increase the presence of tooth decay, as the tongue cannot reach in the back of the mouth to clean the molars. The lip or tongue tie often causes a lisp or difficulty pronouncing certain sounds. In having had a personal experience with her own son Dr. Thomas knows how important proper feeding is for the relationship between baby and mother. Dr. Thomas has taken a special interest in treating restrictive frenulums. She performs frenectomies using the soft tissue laser, which allows her to zap through the excess tissue with extreme precision and ease. Frenectomies at Enclave Dental are far more comfortable and heal faster than those performed by traditional means. Thanks to her advanced approach and specialized knowledge, Dr. Thomas has performed more than 700 frenectomies in her career — and that’s a lot of babies and mothers helped! If your baby’s problems breastfeeding are causing you both to feel frustrated, they may be dealing with lip or tongue tie. Dr. Thomas is the Southlake dentist providing efficient, comfortable frenectomies from the comfort of the Enclave Dental office. Schedule an appointment to discuss the need for a frenectomy today! Comments Off on What Is An Abnormal Frenum? Is Frenectomy Necessary?